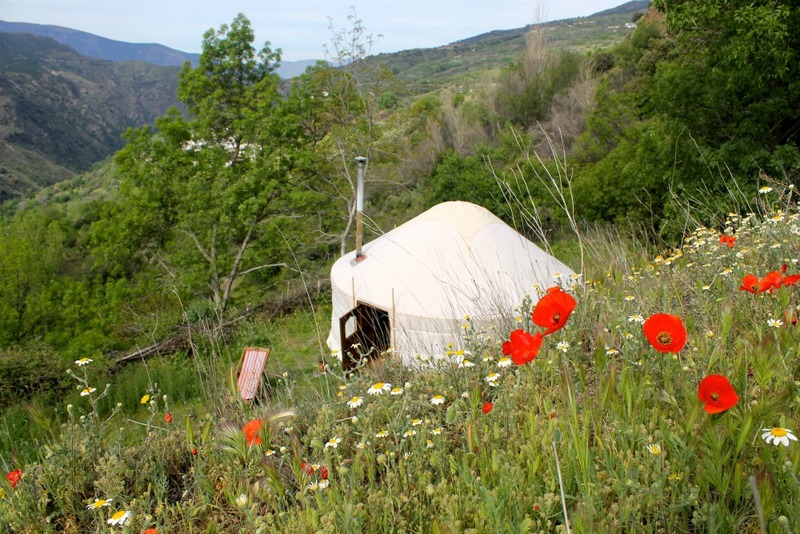 Last weekend we took Little Miss Go GranadaSpain for her belated 5th birthday treat: a glamping trip in La Taha Valley. We were booked for two weeks earlier, but it was rained-off, and our very accommodating hosts were happy to let us postpone. And for that I am very grateful because we had the most magical time! As a small family with a young child this was the perfect break for us, but it would also make a perfect romantic getaway for two, or a delightfully relaxing and rejuvenating pit stop on a walking holiday. 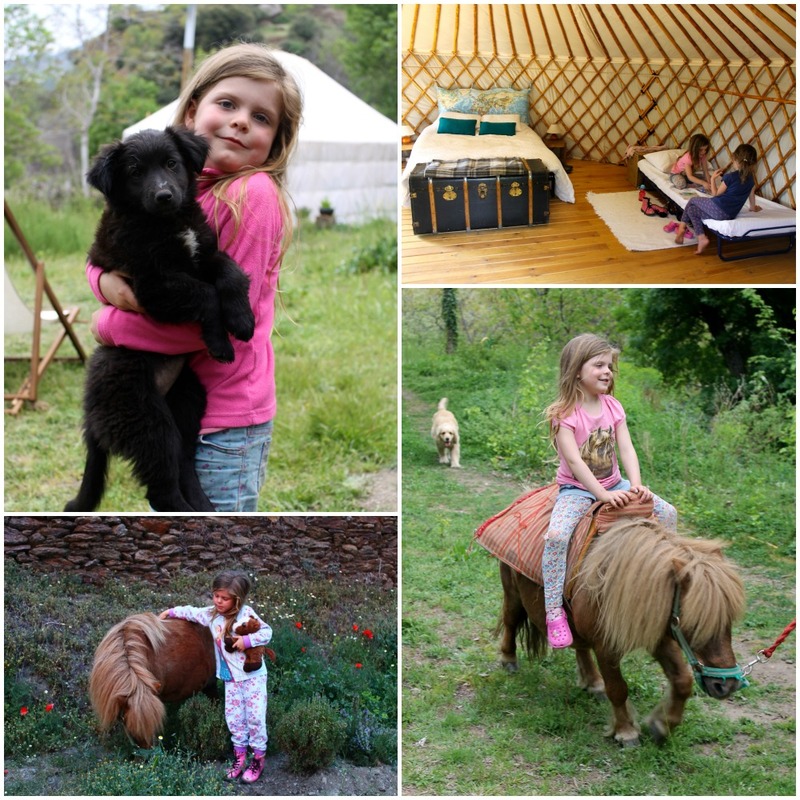 The owners, Claire and Andrew, live with their three wild sierra girls, six dogs and a pony in the most beautiful spot in this lush green valley. It’s off-grid, off-road and wonderfully free of light and noise pollution, but instead, abounding with the sights and sounds of nature. 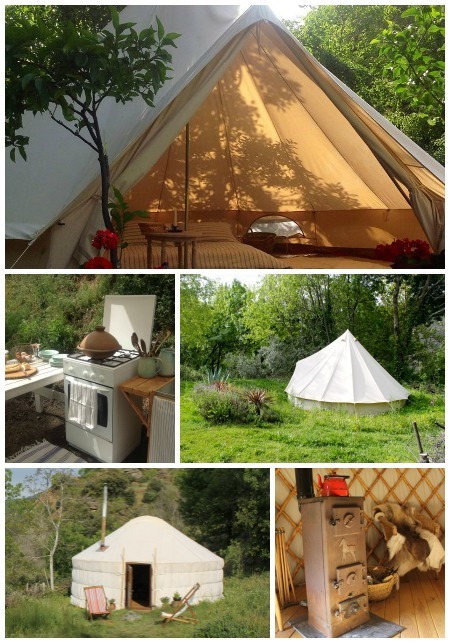 What they have created there for lucky visitors is something really very special, offering the choice of a yurt, that could comfortably sleep a family of four, or a 5m deluxe bell tent, each with an outdoor kitchen on their own private terrace. We had booked the yurt which is beautifully made and immaculately presented. Inside it is deceptively spacious, light and airy, yet cosy. You can just imagine the fun they must have had, and of course the hard work involved, on the day that it was contsructed. You can also see the love and care that has gone into making it so comfortable and welcoming. We arrived on a Friday afternoon and parked-up just outside the small village of Atalbéitar, where we were met by Claire who escorted us on the 10/15 minute walk up to their small-holding on the terraced hills of La Taha. 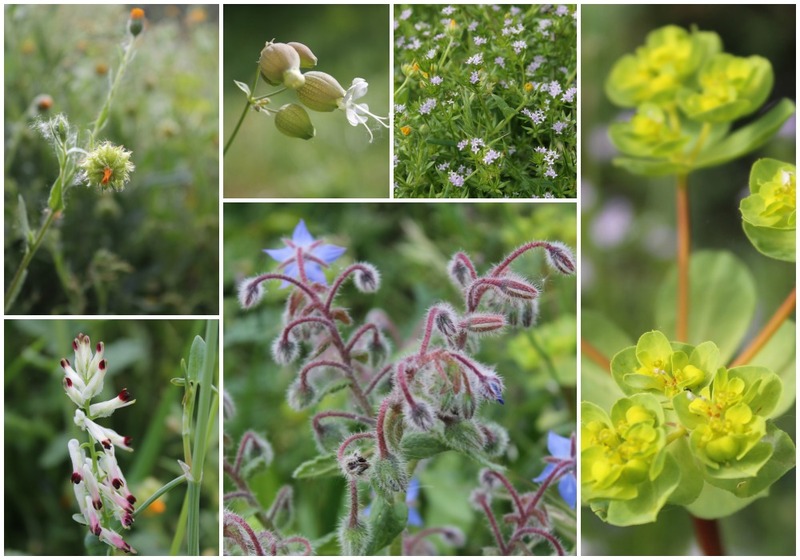 We passed through the village and along a well-kept and windy path, banked with a crazy array of wild flowers, through the woods, stopping occasionally to take in the view and get our bearings in relation to the area’s cluster of little white villages. It is absolutely breath-taking up there in springtime so I can only imagine how stunning it must be in the autumn. 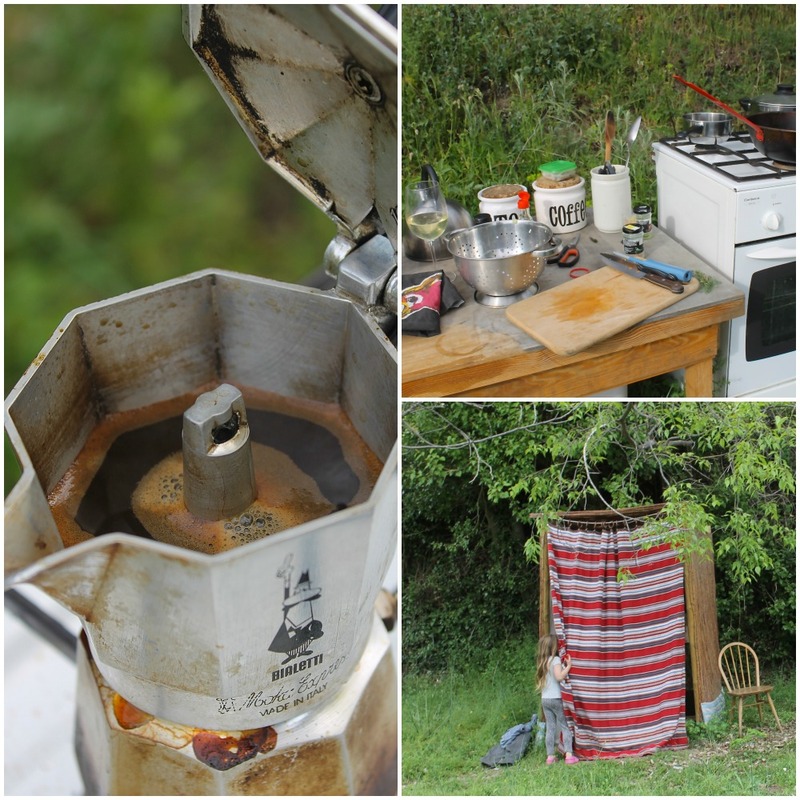 When we arrived and saw the yurt, and the view from our outside kitchen and dining area, we were all practically skipping with excitement: me at the thought of making the evening meal and my morning coffee al fresco (call me a nutter or a coffee snob, or both, but I take my Bialetti coffee pot with me everywhere I go – even to Thailand), and my daughter at the thought of sleeping in a yurt. Mr Go GranadaSpain kicked off his boots straight away just to feel the grass between his toes and we put the kettle on. Much to the further delight of my daughter we were visited by their hard-working and incredibly friendly pony Hazel, and she was even lucky enough to be offered a ride. She also got friendly with a few other family members of the two-legged and four-legged varieties giving me the chance to get dinner going and enjoy the view with a quiet glass of Cava. The kitchen had pretty much everything that I needed to make a simple meal and Claire even lent me an extra frying pan. She will also cook for you if you like. The yurt has a wood burner and wood is also supplied. We didn’t actually need a fire but I imagine that you could get quite a nice fug up if you needed it. The compost loo was simple and convenient and the shower was piping hot in the morning. What more could you ask for? The bed? The bed was super-comfortable. In fact, when I was tucked up with my copy of Harry Potter y el Calíz de Fuego that night, my little Angel sleeping like a log in her bed, I felt like I could have been in a luxury hotel room – but thankfully without the mini-bar and flat-screen telly. Atalbéitar is on the Busquístar – Capileira section of the GR7 walking route so this would make a great overnight stop for any walkers looking for some comfort, a good meal and a sound nights sleep. The only thing that we regretted about our stay was that we had not booked for longer. If you were to stay a couple of nights or more, there are some lovely walks in the area through the valley, along the Río Trevélez and taking in the villages, and bars, of Atalbéitar, Ferreirola, Capileria, Pitres, and Mecina Fondales. There is also a rather famous (locally) pizza place, run by an Argentinian, in Mecina Fondales called Cuevas de la Mora Luna that is a must for hungry pizza fans. 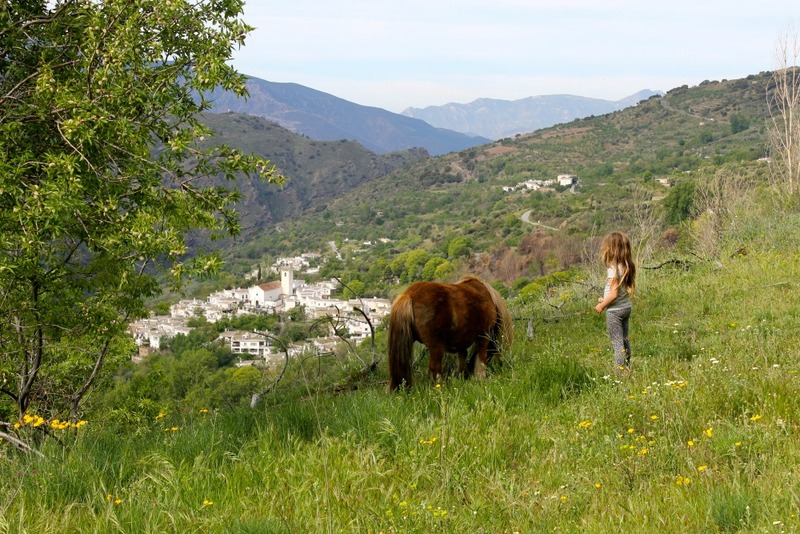 A little further afield there are also the villages of Pampaneira, Capileira, Bubión and Trevélez to explore. And if you are visiting in the summer and want to find a place to cool down there is also a refreshing waterfall at Junta de los Ríos above Pórtugos. To make an enquiry you can contact Claire direct via the website, Facebook or book on airbnb. Atalbéitar is about 40 minutes by car from the market town of Órgiva. Follow the A-4132 to Pitres, taking you first through Pampaniera and then past the turn-off for Bubión (there is a very reliable petrol station, El Mirador de Poqueira, just here). After Pitres there is a rare bit of straight road and on the right you will see a sign for Atalbéitar 2km (just before the Pórtugos petrol station on the left). Take this and follow it as it winds down to the village where you will see a parking area on the right (opposite the bins). Claire or Andrew will meet you here with Hazel, La Taha’s friendliest pony, to carry your bags for the last leg, on foot, to your beautiful yurt. The nearest airports are Granada (1.5hrs approx), Malaga (2hrs approx) and Almeria (2hrs 30mins approx). I hope that you find this review useful and would love to hear from you if you go off Wild Sierra Glamping. I am sure that you will love it as much as we did. Click the Country Kids badge for more outdoor fun with kids.